Italian Caffeine Curator. Founder of MacStories. Member of Read & Trust Network. I’ve been playing around with the latest Nebulous Notes update this weekend, building macros for my Markdown-writing workflow. I ended up browsing Pinboard for some new Markdown tricks and resources, so I decided to repost the links I’ve saved here. Docverter: A hosted pandoc. Useful if you don’t have your own server to do remote file conversions. Dillinger: HTML5, web-based Markdown editor. It’s got a cool UI, theme options, and possibility to link with Dropbox and Github. Byword Markdown syntax: Always useful to keep around if you use Byword. LinkFester: Useful tool to turn RSS feeds into Markdown lists of links. I used it for my Pinboard and Instapaper feeds, and it worked like a charm. Rune Madsen points out that third-party developers should crop out the status bar from App Store screenshots (what’s up with the status bar, anyway?). On the other hand, developers of photography apps can take advantage of the iPhone 5’s “low-light boost mode” with ISO speeds up to 3200 (via John Gruber). You know who else is listening to completely justified and reasonable negative feedback? Evernote is. Looking forward to how they keep improving the new Skitch. They need to find a new balance between old users and features, and their new platform environment. I think Evernote can pull this off. Apple doesn’t deserve a pass on Maps because they’re “new” at it. They have years of data on geo. If it wasn’t as good, it shouldn’t ship. You might think that it was necessary for Apple to ditch Google. But you’re *mad* if you think Apple handled that transition right. iOS Maps story plays to the worst clichéd views of Apple: arrogant, US-centric, glossy sheen over shoddy tech. This story will have legs. @counternotions I totally agree, but this isn’t about starting - it’s a downgrade for all 400m+ previous customers upgrading from iOS 5. As the principle goes, among three favorable options only two are possible at the same time. Rethink core functionalities, Offer major new user features, Keep developers happy: Pick two. I like the refinements of iOS 6. I don’t care about some new features. I don’t like the changes to the App Store search so far, and, more importantly, I don’t think the new Maps – in its current state – is good for “regular users”. There’s a tension between the tech press – we know that Maps will get better with more data and time – and the average user, who doesn’t (and shouldn’t) know about the bad blood between Apple and Google. I try to address these concerns and questions in my iOS 6 coverage today. If you’re only interested in the features: don’t miss our list of iOS 6 tips and tricks. In watching the latest gameplay footage of The Last Of Us from PAX, I was reminded of a subject I’ve always wanted to tackle with a few words: realism in videogames doesn’t age well. Recently, I’ve started playing the original Metal Gear Solid for PSX through the PS Vita’s Classics feature. It’s a great game, but what once looked like a major milestone in “making things look like real life” is now all pixelated, fuzzy, and funny at best. Obviously, MGS compensates with other aspects to remain a masterpiece to this day. Same with every GTA game for PS2. Back in the day, my jaw dropped when I saw CJ walking around the streets of Los Santos. Today, that realism doesn’t seem so realistic. Compare that to timeless gems like Chrono Trigger or Final Fantasy Tactics, whose distinctive non-realistic style isn’t anachronistic – it looks like a deliberate choice. Big changes happening at Read & Trust, the great network of writers I’m a proud member of. Gone is the weekly newsletter format with Amazon payments, leaving room for a (much better in my opinion) magazine format with beautiful layouts, great typography, and a friendlier payment system with PayPal. Enter the Read & Trust Magazine. Rather than the weekly emails that you’ve been used to, the Read & Trust Magazine will now be a monthly collection of articles from five contributing members. The text is still the star, but the content will be delivered in a way that is better for everyone. You can sign up here (affiliate link). Every year on the 3rd of September, this takes place in my town, Viterbo. 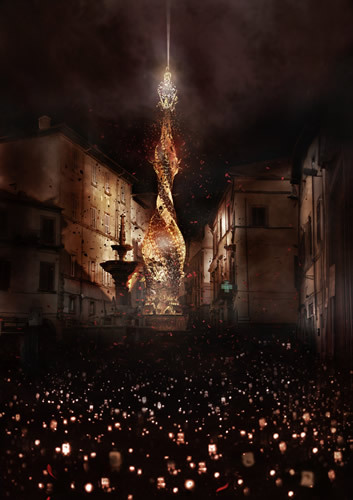 La Macchina di Santa Rosa, a religious celebration that has been taking place in Viterbo for centuries, is, beyond the religious aspect, simply breathtaking. And it’s quite hard to describe to someone who has never experienced it. From an engineering standpoint, you have this 5-ton tower-like structure (made of steel, aluminum, polystyrene, plaster, paint water) that is carried through the narrow streets of Viterbo by 100 men. That alone is quite a feat, considering the complex calculations that take into account center of gravity, weight, and shape of the Macchina to ensure those men can bear with oscillations (on average, each man carries 80 kilograms with oscillations up to 150 kilograms on a single shoulder – see this photo to get a sense of how they do it). Good list by Daniel Feit. I’d add this: last night I bought Metal Gear Solid as a PSone Classic, and in spite of my Vita being set to English, the game was downloaded in Italian (which has terrible voiceover and translation). I assume that’s because of my PSN account being associated with an Italian credit card, but that’s no excuse for the lack of options (I can’t change it to English). Also, again: what’s up with the PSone Classics disparity between regions? Nice overview over at the official PlayStation Blog about the Vita’s latest system software update. I have been playing with my PS Vita a lot more lately, and I like the improvements Sony is making to the device’s software. Notably, this version adds rear-touch scrolling for the web browser, PSone Classics support (with weekly rollouts), more visible options for notifications and maps, and physical button browsing in the Home screen. Interestingly, the European PSone Classic is far richer than the US one for now. See also: Sony’s Vita announcements at Gamescom 2012.